Place greens on four salad plates. 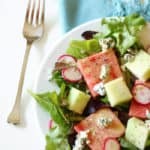 Add watermelon and honeydew squares and top with radish slices. Crumble blue cheese over top. For the vinaigrette, place all ingredients in a small bowl and whisk together until combined. Drizzle vinaigrette over salad and season with salt and pepper to taste.